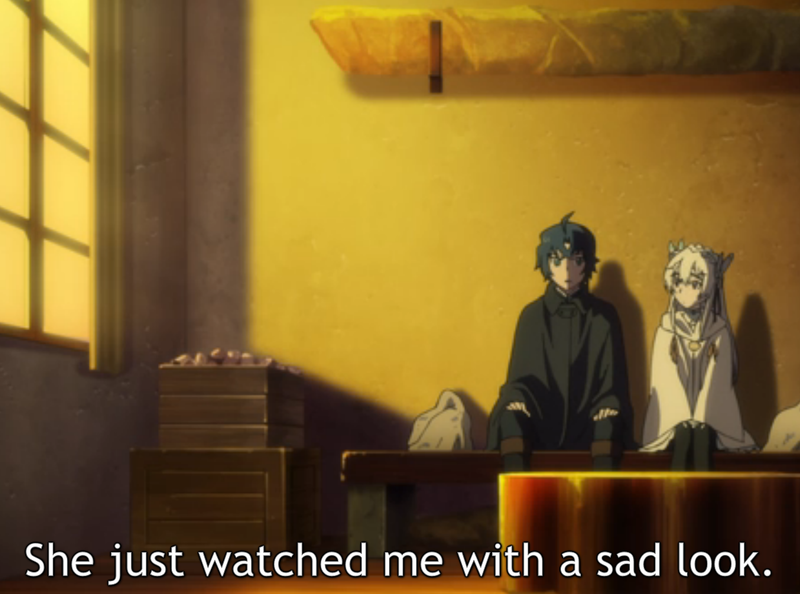 I Blog Anime: Hitsugi no Chaika: You have angered me again. Hitsugi no Chaika: You have angered me again. Y'know, Chaika, you were keeping me happy for a good while, I was really enjoying the show. Why did you have to aggravate me again? Look, see, I understand that you can't freely convert everything, and I always look and judge with that in mind, but now you've just pissed me off. You've shown your true colors, and honestly, you didn't need to, you could have avoided it and kept me happily in the dark. With how completely 'safe' the stupid story is, they didn't even need to bother animating the scene, they could have just had Tooru say the story aloud, and it would have been just as frivolously ineffectual at making us care as much as we should have. OH! But then you wouldn't have been able to completely fabricate a new character with the scenes! Tooru's 'Mentor' never existed anywhere in the original story. I smell an end-card. So the show finally got around to putting in Tooru talking about his memory of Hasumin. Her name isn't even the same. The featured sentence is one of the very few pieces of her story that remain, of the original lesson it conveyed. Perhaps I should say emotion, but the story's purpose, in manga and anime, is to teach us an important facet of Tooru's life. The problem is that the anime's lesson is completely wrong. The anime version of the story is much more sterile and 'safe' than the manga's story, revealing that the studio behind this is balking at featuring such critical material. Y'know what, just, go read it for yourself. It saves me trying to dance around spoilers, and since the anime has forged a completely different story for themselves, knowing the original isn't going to spoil you for anything either. To reassure you even further, I also mention that this story was told before they even went into the first hero's mansion. You're not going to spoil yourself on anything. The story takes place near the end of Chapter 4, page 30'ish, and continues into Chapter 5. I say 30'ish, because it will vary based on translators credit page sizes, and whether the hosting site numbers them. Some websites also include fan-art, so the number may vary, but close to the end of Chapter 4. A word of caution. I meant it when I said the anime made the story much more 'sterile' and 'safe'. This story is a wrenchingly painful memory for Tooru. I don't think I'm ever going to get a better example for why these changes in the anime are so irritating for me, but this will be the last time I talk about it. I'm completely disenchanted with the anime as a telling of the powerful story the manga contained, and I'm going to watch the rest of it from here on out keeping in mind that the studio has opted not to risk offending anyone. I doubt anything amazing is ever going to happen. Well, anything amazing that hasn't already been done before. So in short, I now understand why this show is aggravating me so much more than any other anime ever has, when changing the source material. It's one thing to change material to make it fit better. It's another matter altogether to change it because you're afraid of attracting controversy with polarized material. If you were going to chicken out, you shouldn't have accepted to do it in the first place.